If you are too extra for pumpkin spice, make this pie. Using a pastry cutter, cut in the butter until the butter is in small pieces throughout the mixture. Some pieces can be as large as a hazelnut and others as small as a rolled oat. Add in the ice water. Stir with a fork to combine until it becomes difficult, a few seconds. Then, bring the dough together by pressing and folding the dough in the bowl. If your hands are warm, you can transfer the mixture to a piece of plastic wrap. Use the plastic wrap to gather the dough by lifting the plastic and folding in from the edges. On a lightly floured surface, roll the dough out to a large circle, about 12 inches in diameter. Carefully transfer the dough to a 9” glass pie pan. Gently lift the edges of the dough to allow it to slump in and fill the corners of the pan. Trim the edge so that it is only overhanging by an inch. Fold under the overhang and press lightly to create a smooth edge. Crimp. If the dough gets sticky or warm at any point in the process, chill the dough for 10-15 minutes in the refrigerator. Dock the botton of the crust. Freeze the shaped crust for an hour. Can be frozen for up to a month. Once frozen, tightly cover if freezing longer than one hour. Preheat the oven to 400°F/204°C. Butter a piece of foil that is large enough to fill the base of the pie and go up the sides. Press the foil, buttered side down, in to the frozen crust. Do not fold the foil over the edges. Fill the foil lined crust with pie weights, I use uncooked beans or rice. Bake for 20 minutes in the middle of the oven. Remove the foil and bake until the base is lightly browned, about 15 minutes. Once the base is lightly browned, remove and cool to room temperature. Place all of the ingredients in to the bowl of a food processor fitted with a blade attachment. Pulse a few times to mix, then process on low until smooth. Pour the filling in to the pre-baked pie crust. If the edges of the crust are already medium brown, cover the edges with foil to prevent over browning. If you do not cover the edges when it first goes in, keep an eye on the crust and cover with foil as needed to keep the crust from burning. Bake at 375°F/190°C until the filling is set but slightly jiggly in the center, about 50 minutes. Combine the egg whites and sugar in a medium, heat-safe mixing bowl set over a bain marie. Warm to 160°F/71°C while stirring constantly. Remove the mixture from the heat. Transfer the mixture to the bowl of a stand mixer fitted with a whisk attachment, whisk on medium until the mixture is foamy. Add the vanilla and salt. Whisk on high until the mixture is fully cooled, glossy, and stiff peaks have formed. 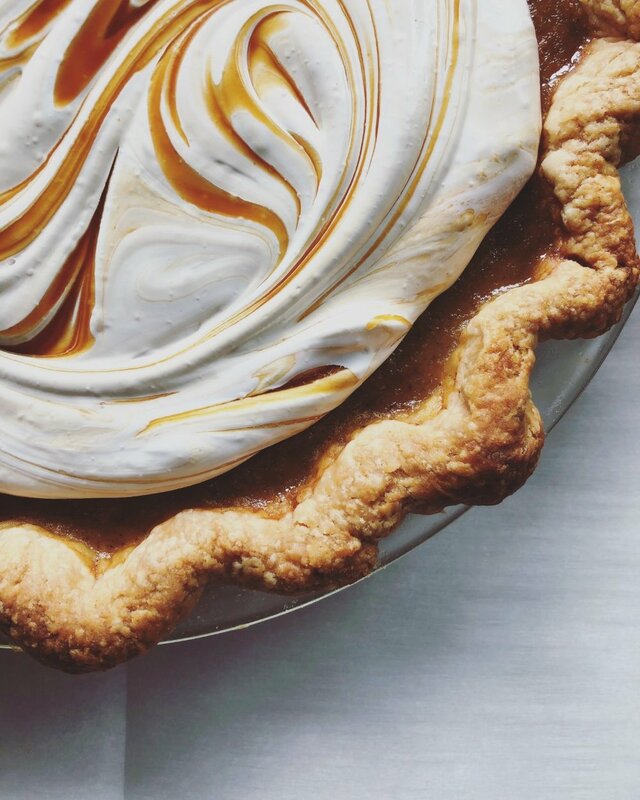 Top the baked pie with the prepared meringue. If you would like, swirl the meringue with caramel sauce. I used this chai caramel recipe. Alternatively, you can torch the meringue for a toasty flavor and dramatic appearance. Cool to room temperature before transferring to the refrigerator. Chill for one hour before serving. Can be made one day ahead.